You may be familiar with a certain theory of motivation called Maslow’s Hierarchy of Needs. In brief, there is a necessary progression of the fulfillment of a person’s needs, such that one usually can not fulfill higher-order needs if their lower-order needs have not been satisfied. 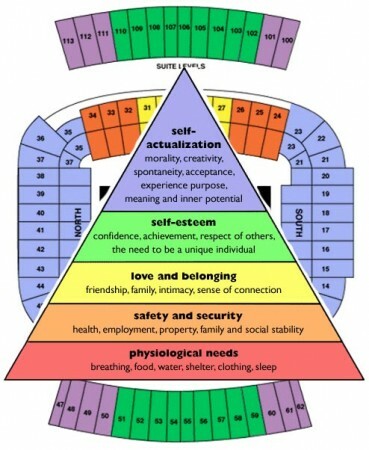 At the bottom are basic physiological needs like food, water and sleep; above that level are needs for security, then needs for belonging, needs for esteem and at the pinnacle, needs for self-actualization. A football team has a similar sort of hierarchy, and the more I look at this year’s Tiger squad, the more I see that each of these needs is being fulfilled in succession. Our first game against Louisiana Tech proved – if nothing else – that Auburn has the necessary tools at her disposal to field an effective football team. We could be said to be sound of mind and body, even if a WAC team wouldn’t be stiff enough to prove much beyond that. Against Mississippi State, we proved that we could measure up not just against WAC contenders, but also against SEC competition. The West Virginia game removed any shadow of doubt that we were Auburn again – family again. And after a brief tune-up against Ball State, we traveled to Neyland Stadium to face the defense that fought like hell against the Gators, a tough unit with a tougher man commanding them. Auburn stared Tennessee down, finally earning a measure of esteem, and is now validated in the polls for the first time in almost a year. And we certainly have earned it. We’ve proved that we can hang with explosive offenses and rock-solid defenses, and we’ve come out on top each time. It’s time to recognize. Moreover, it’s time to recognize that Auburn’s quiet, unassuming head coach Gene Chizik has built a team that bellows from the gridiron turf on his behalf. Whether that team is the group of talented young men who run, throw, catch, kick, tackle and pound it in the trenches, or the cadre of coaching talent that gameplan, strategize, coach, motivate, and playcall, Gene Chizik has done a hell of a job as their leader. And for all the bare-chested whiz-bangery of Tennessee’s off-season, for all of Kiffin’s smarminess at the podium, and for all of their YouTube-ing, Lane Kiffin has not done half as much. The final level in Maslow’s hierarchy – self-actualization – is something that we can’t be said to have achieved until the final ball is blown dead this winter. Truth be told, we have a long way to go. But there are the hallmarks: creativity under fire, spontaneity, adept problem-solving. I feel again like I did in 2007, when they sky was wide open for the plainsmen. I don’t worry about what things we’re lacking any longer, because what we need we will find or make as we already have done. I’m ready to see what these Tigers can really do. First of all: Ryan Pugh needs to cut it the hell out. What do we have to do to make this guy not chop block? On one hand (and maybe I just don’t have that kill3r instinct,) if the only way to stop a man is to risk injuring him, ending his senior season, and altering a big chunk of his future Sunday play… then that man wins. End of story. But what’s really bothersome is that there was no reason at all to go after that tackle’s ligaments. Todd had time, Fannin was gloriously open, and if the tackle was giving the guard trouble, why not just, I don’t know, double-team the tackle? Am I missing something here? Is there some reason why Ryan Pugh shouldn’t still be doing up-downs for that blatant repeat offense? This is just another way our lack of depth hurts us. Even when Pugh plays dirty, we’re over a barrel. There can’t and won’t be any Saturday repercussions for him, because he’s basically all we’ve got. Other than that, I really have to hand it to Monte Kiffin – what a game his Vols played. My hat’s off to ‘em. Even when they looked gassed – late in the second half, no less – that tired bunch of warriors kept playing and Kiffin found a way to wring a defense out of their winded carcasses. It was damn near impossible to score in the red zone. Long passes were simply not available. Margin of victory was four (really, three,) which is one quarter what we had been averaging prior to this tilt. It was the first game since La-Tech in which we did not score a touchdown in each of four quarters. Granted I’m never happy to see the tigers struggle but wow, it was a helluva good time to see our offense go up against that snarling defense. …and win. Sometimes, it was because of an excellent playcall by Gus Malzahn. But sometimes, it was a play that blew up in our faces that somehow we turned into a success. Todd sidesteps, freezing an orange-jerseyed blitzer, and delivers the ball right to Trott. Or, Todd, running from heavy pressure, throws across his body back across the field to Trott, for another first down. Or, McCalebb completely reverses field and laser-beams off for a big gain. Essentially, we did to the Vols what other teams have so frustratingly done to us in the past – succeed even when they do everything right. We found a way, or we made a way where there was none. Kiffin’s defense scoured the field until all that was left was guts, and the tigers had it. I am more and more disappointed every week that this is Chris Todd’s final season as a Tiger. And even if we didn’t score as consistently as we normally do, this was the first game all season in which we led from the very first possession and never trailed. Now, Eric Berry was all over everywhere and every which way. Watching the Vols play last Saturday was a little like watching Troy Polamalu play for the Pittsburgh Steelers – the safety was in or around every play, anywhere on the field. He could play blindfolded for the Hellen Keller School for the Deaf and Blind and still, Eric Berry would have his day, and every game in which he plays that the offense does not throw him a pick is a game that contains an important, tactical victory. So lots of folks are rightly jacked about Ben Tate flinging “4 Heisman” aside like a third-grader. I second that emotion – that hit was a shoulder-ful of unmitigated awesome. But give Tate credit for everything he’s due. At one point in the game, Tate was taking the rock around the tackle and Berry appeared down at the line of scrimmage, waiting to administer a collision. Ben gave a simple juke and took Eric Berry right out of his boots, hit the edge and sped off for a good gain. He’ll go around ‘em or he’ll go through ‘em but either way Ben Tate is goin’ – “fifth dimension” or not. I remember when we recruited Berry and he inexplicably committed to Tennessee. I’ll never forgive him. But just as we could rightly compare his field presence to Polamalu’s, we may end up comparing him to a talented, game-changing SEC player from a different era: Emmitt Smith. This was just a weird game for our defense. On one hand, Tennessee’s scoring drives mostly resulted from busted plays. One was a really brilliant double-move (credit to Lane for that one) after which we missed the tackle, and all the momentum swung to the Vols. The other was that screen/swing to Hardesty, when we completely failed to tackle and he sprinted all the way into the endzone. Goes to show that when you fail to tackle, winning the ball game is much more difficult. And there seemed to be a lot less of the run-through-or-whiff-by-the-ball-carrier style tackling. Auburn defenders were squaring up to make sure they had their man cold before they delivered the hit, and it worked. For the greater part of the night, Tennessee struggled to get anything done offensively, whatsoever. The first three quarters were lights-out, and the goal of our last possession was to force Tennessee to use up clock, not necessarily to keep them out of the endzone. That was as smug and meaningless a touchdown as ever there was. We did what we set out to do. On the other hand, the problem was Volunteer execution. Crompton had men open pretty consistently, and if he had hit his receivers in the hands instead of the earhole or the scapula, or if they had caught balls when he hit them in the hands, the Vol offense would have been a lot more productive all game long. Those crossing routes in the first half would have meant numerous first downs. The pick/smash they ran five or six times before they hit it was well-drawn up and well-called and a potential can-opener for our thin, young defense. Case in point is the fourth quarter. Now, I know that we had altered our coverages by that point to basically just keep the game out of reach. But “softer coverage” should not be equivalent to “barf away the yards.” Some light clicked on way up under Crompton’s helmet and he started making throws that he would never have made in the first half. Receivers caught balls. The Vol offense moved and it moved with purpose and conviction roaring downfield on the strength of the pass. I couldn’t explain how they did it if I tried, but once Tennessee gets a viable quarterback, they could be very dangerous. Democracy is fascism. Black is white. Night is day. And yet, I still don’t know if that’s our defense’s fault per se. Arguably, we didn’t even get to see the Vol offense until Hot Crompton in the fourth. And being that Auburn’s coaching staff seems to work by watching a team in action and adjusting to what they do, that may have been the ultimate (and unintentional) rope-a-dope. What kind of halftime changes is Roof supposed to make to adjust an offense that is shutting itself down? Once again, Crompton, you leave us with few answers. The special teams story of the night was the return teams. Frenchy bobbled, muffed, or missed exactly zero punts. McCalebb was a kick in the pants on kickoff returns and provided a much-need chunk of field position exactly when it counted. I don’t know what’s changed since last week, but something sure has, and for the better. Moreover, Foot Lauderdale accounted for twelve of our twenty-six total points, recalling fond memories of Damon Duval. Those SEC weekly honors are well-justified. And Durst punted five times for 43.6 yards a boot, only one of which was returned. Well done. The one really dangerous area was on the kickoff coverage, which continually seems about one block away from giving up a touchdown. I don’t know why that area hasn’t gotten up to speed quite as quickly as the others, but I got the heebie-jeebies every time. Giving up 25 yards a return is not a good way to help out a struggling defense. By the way, Chris Todd punts. Did you know that? I didn’t know that. According to how I’ve been looking at things, we should have lost were fortunate to win this game last year. And if at any point in last year’s game Crompton had played like he seemed to play late in this year’s, we would have been beat and beat bad. But this year, Auburn won convincingly. Just so you know, I put a dark dot to indicate the end of the half, and a light dot to indicate that double move by Stocker. Still 100% positive. We ended at about the same place versus Tennessee as we did versus West Virginia, but we led almost the entire game. Oh, and since I know you’d want to see, here is a graph showing our performance versus the Vols, and the results from the Volunteers-Gators game before. The final point of Auburn’s line is just a hair better than the final point of Florida’s. Moreover: there are brief periods during which Florida’s line is above ours, but overwhelmingly, we were better than Florida in adjusted yards against the Vols. Beat ’em worse than the Tebow! That Florida – Auburn comparison is fascinating! The overall shapes of each are nearly identical. It’s interesting that Florida’s is soo much shorter – probably due to the ultra-conservative play-calling by Kiffin to lessen the loss. Also, it’s fun to speculate that if Lane hadn’t killed the clock against the Gators, the next series of UF plays would have mirrored the final peak in Auburn’s line. Again, fascinating.